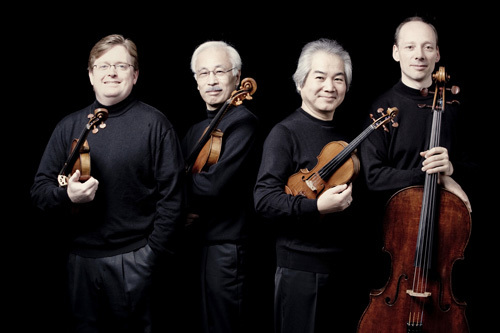 We have long been accustomed to such rich musical experiences from the Tokyo Quartet that it is difficult to think that they could be improved upon. Yet this concert, featuring late quartets of both Haydn and Beethoven, coupled with a rarely-heard quartet of Paul Hindemith, did just that, communicating with a radiance and power that is rare. The overall musical judgment and technical perfection of the quartet of course have never been in doubt; the new element seems to be the intense inward concentration and sense of discovery everywhere in the playing. Perhaps this is a natural evolution: after a decade, the newer members of this ensemble, Canadian violinist (and former UBC professor) Martin Beaver, and British cellist Clive Greensmith have now fully meshed with its original members, Kazuhide Isomura and Kikuei Ikeda, allowing the quartet to now speak very much ‘with one voice’. Over its 40 years, the Tokyo Quartet has never been strangers to Haydn; one of its celebrated early recordings for Deutsche Grammophon was the complete set of this composer’s Op. 50 quartets. The G-major quartet, Op. 77, no. 1 played here is one of Haydn’s very last quartets, exhibiting all the characteristics that make him a true master of this form. Right from the work’s wonderfully bouncy opening theme, it was apparent just how closely the players listened to each other and just how sophisticated was their sense of detailing, dynamic shading and balance. The opening Allegro moved perfectly from beginning to end, finding strong intensity when needed but always giving meaning to the softer passages. The tempo of the Adagio was also judged superbly, allowing its radiant, expressive moments to soar out of the underlying texture with both strength and feeling. After a smart rendering of the truculent Minuet, the presto finale closed the work with just the right combination of wit and buoyant energy. Hindemith’s Fourth Quartet (1921) is a remarkable work for a composer only in his twenties. It innovatively contrasts slow, thoughtful movements (developed chromatically) with abrasive and powerful ones, often hinting towards Bartok and Shostakovich. The Tokyo Quartet brought exceptional intensity to both dimensions, treating the latter with an attack and projection to match anyone, yet also coaxing a concentrated inward expression out of the quieter, lyrical constructions. While some of the pensive material does meander at points, this performance convinced me that this work can flow from beginning to end in spite of deficiencies. While the Hindemith might appear to link to Beethoven’s Quartet No. 14, Op. 131, by virtue of their comparably slow opening fugues, the comparison stops there. This seven movement work is probably Beethoven’s greatest string quartet, capturing the widest range of expression from sublime tenderness to noble strength by the integrated use of mere fragments of musical themes. The work is essentially a long journey within a single movement. The Tokyo’s performance was very subtle, indeed starting rather understated and plain. However, as more and more integrating motives appeared, the intensity and expression were increased too. Everything earlier in the work was continually given renewed meaning and sharper focus. At the end, the full complexity of the work was physically and emotionally exposed in its richest form. One could only feel that this was one of the greatest string quartets ever written. It is a rare occurrence to hear an ensemble play every note of each work without one lapse in concentration, providing an endless stream of inspired musical communication. But this concert by the Tokyo Quartet was so special for exactly that reason.